A customer at a local car show brought this broken pot metal Bell Boy emblem to Muggy Weld for repair. Mike Muggy used a file to grind off the chrome plating on the back of the part, made the repair with Super Alloy 1 and a propane torch, and removed the flux. 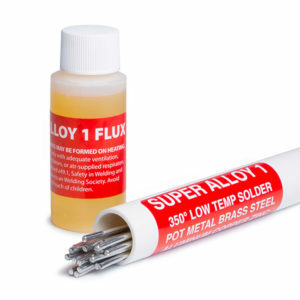 Super Alloy 1 worked great and the customer can now re-plate his emblem or paint as needed.